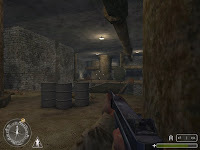 2 single player map. Your an oss agent who's cover has been blown! You must fight your way through the city and make your way to tunnel 17! I Just decide to get to modonline this we to see if there was no new map in their database and hopefully for us there was... to 'out of grave map from Briant that were release at the end of 2007. Like other map from Briant it's not perfect but it's another fun to play through map with correct design and good scripting. Design: the experience take place in Italy where you first aim is to travel through a typical street of Sicily where german are waiting for you...the design is soft and well balance sadly it looks a little to squary and flat second mission will start with the sewer access where the invironment is a succession of machine, pipes and hallways that look more realisitic than the first part even if lots of room are mission details to create a cool ambiance. I just eccounter some flashing effect while I was progressing as if the compiling process has caused some vertice bug... hopefully it doesn't affect to much the gameplay. Gameplay like for all previous releases from gunrock is perfectly manage in a squad oriented progression. 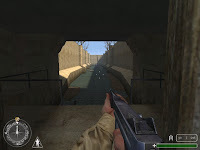 It's Linear and doesn't feature any puzzle objective but ambushes mostly in the sewer part awaits you to give you enough challenge, the only aim is to get out of tunnel 17. The ambiance is ok but misses more sounds and a use of reenforcement in several places would have create a more immersing experience. In conlcusion: It seems that several map from Briant are still hanging here and there...Design is just a little above average and scrpipting is well handled sadly making a realisation not enough challenging (like all other release from the auhtor) just makes the experience too short... it's still enjoyable and recommended for a short playtime.